Another post from my other blog, another about Sharon Creech. She deserves two posts here, and (for a change), this one is about her books and not about my stumbling efforts. 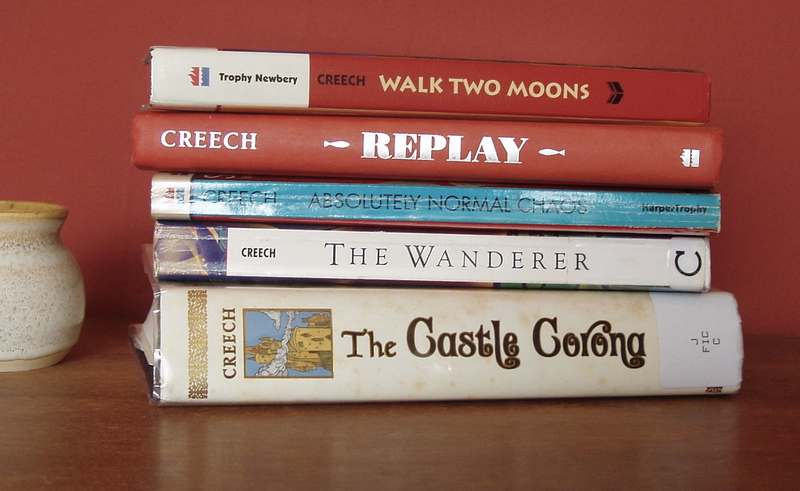 Quick post for today [October 2010], about Sharon Creech’s books. Walk Two Moons, her Newbery Medal winning novel, had been on my shelf for years before I finally read it in 2009, and I was so happy to find a new (to me) author who could tell such great, powerful, entrancing stories. Creech deals with tough issues: the death of one or both parents, first love, family conflict, misfits (in family and society), facing one’s fears. I hear Ishmael, Jim Hawkins, Robinson Crusoe, Jonah and the narrator in an Iris Murdoch novel called The Sea, The Sea (1978 Booker Prize winner). And then the Conor McPherson play, The Seafarer–about several men outsmarting the Devil on a Christmas Eve. I love a story that can call up so many echoes, yet even without all those connections, The Wanderer is still a great tale of a sailing voyage across the Atlantic, with each of the 5 crew members on a personal quest, each with mysteries about their pasts, presents and futures. I can make a true song/about me myself,/tell my travels,/how I often endured/days of struggle,/troublesome times,/have suffered/grim sorrow at heart,/have known in the ship/many worries,/the terrible tossing of the waves,/where the anxious night watch/often took me/at the ship’s prow,/when it tossed near the cliffs. It’s beautiful, mystical, spiritual stuff. Well worth reading. You can find an Old English version here, complete with translation (the source of the lines I’ve quoted). This entry was posted in Newbery Award and tagged Sharon Creech. Bookmark the permalink.